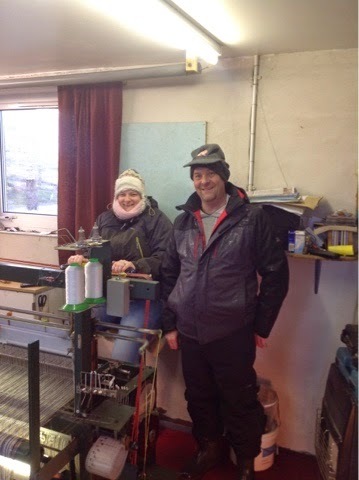 This afternoon we spent an hour with our neighbour in his weaving shed. 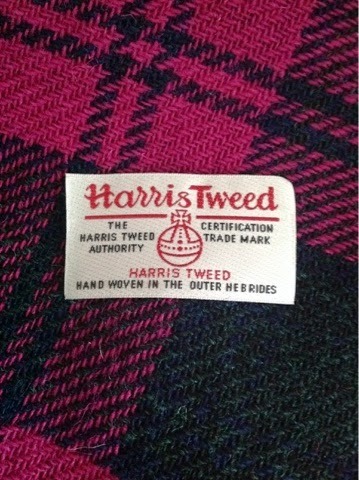 He is making cloth for John Lewis and thinks it maybe for a sofa. It's as easy as riding a bike. Keep it nice and steady and don't go backwards! Blue sea and sky, white surf and sand............. crisp white snow on top of the mountains in the back ground. Having discovered some new glue I have been able to create some absolutely gorgeous earrings this week. They catch the light beautifully and change colour as the light hits from a different angle. 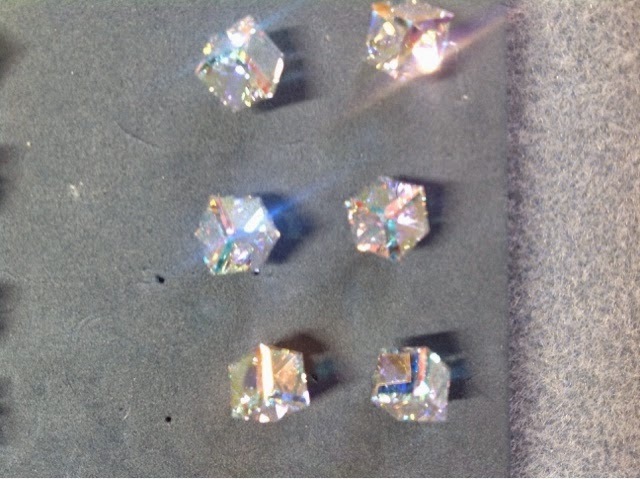 The photos have proved to be tricky and don't show the crystals to their full beauty. They are genuine Swarovski crystals and mounted onto sterling silver earring posts. Treat that someone special or yourself and vists my online shop to purchase. 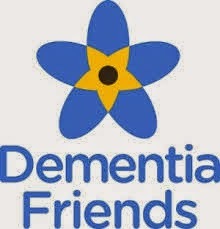 Yesterday I made a pledge to complete an action which will increase awareness of dementia. 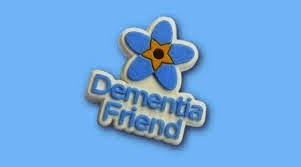 To do this I am adding a badge to my blog letting people know that I am a dementia friend. Click the link below to find out more and share with others. I have been surrounded by shiny things all day today and its been great! These beautiful earrings have gone like hot cakes. It seems that the people of Derby are liking the purple/pink hues this year. I was hoping to have my delivery from Austria in time for todays sale however it wasnt meant to be. The next sale I have will include some stunning post earrings with the same high quality Swarovski crystals I use for my dangle heart earrings. Quite a few people asked to buy the picture frame I made to display the online shop, I am planning to make some in the near future. With Mothers Day just a week away, what do you have planned? Spending time to create something and then being able to eat your creation is bound to be winner. 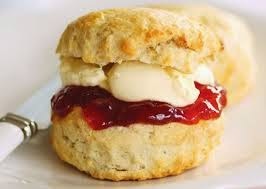 Scones are easy to make and delicious whilst still warm, covered with jam and cream. 1. Preheat the oven to 220°C (fan 200°C/425°F/Gas 7). Lightly grease a large baking sheet. 2. Make a light crumbly dough: Put the flour and baking powder into a large chilled mixing bowl. Add the cubes of butter, keeping all the ingredients as cold as possible. Rub the butter in lightly and quickly with your fingertips until the mixture looks like fine breadcrumbs. Stir in the sugar and sultanas. 3. Pour 100ml (31⁄ 2fl oz) of the milk and all but 2 tablespoons of the beaten egg into the flour mixture. Mix together with a round-bladed knife to a soft, but not too sticky dough, adding a bit more milk if needed to mop up any dry bits of mixture in the bottom of the bowl. 4. Turn the dough out onto a lightly floured work surface, lightly knead just a few times only until gathered together, then gently roll and pat out to form a rectangle about 2cm (3⁄4in) deep. 5. Cut out as many rounds as possible from the first rolling with a 6cm (21⁄2in) cutter (a plain cutter is easier to use than a fluted one) and lay them on the baking sheet, spaced slightly apart. Gather the trimmings, then roll and cut out again. Repeat until you have 10 scones. 6. Brush the tops of the scones with the reserved egg. Bake for about 10 minutes, or until risen and golden. Remove and cool on a wire rack. 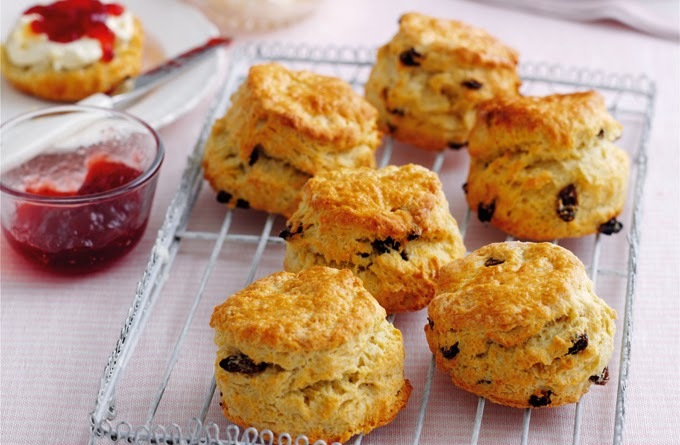 dough is quite deep, dip the cutter in flour before cutting out each scone to prevent the dough from sticking to it. Having the recipe now gives you time to practice so you can deliver the perfect batch to your loved ones next Sunday. All packed and ready to go on Monday morning. 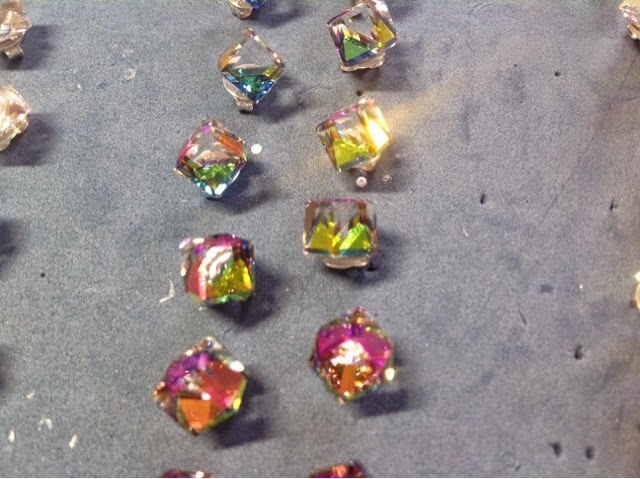 I have managed to grab myself a table top to sell some of my favourite things..... Swarovski crystal earrings. I will be on level 5 outside the restaurant of the Royal Derby hospital from 10 am until around 4pm, or until there is nothing left! I have roughly 100 pairs of earrings, different colours shapes and sizes. Following a preview today I am hoping that Monday will be a success and I can hand out some cards for my website. For the next 5 minutes at least, these are my favourite colour. Take a look at my website and let me know which is your favourite. 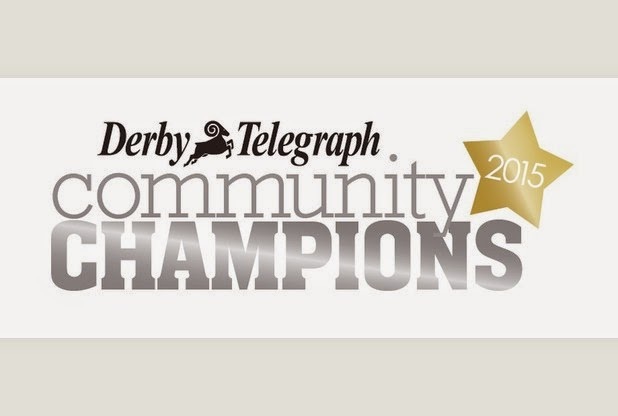 Today as I picked up my Derby Telegraph from the door mat I noticed a small advert asking us to tell them about our heroes. Turning to page 25 I was met with a call to celebrate the people we share our wonderful city with. With several categories to choose from I began to wonder who would get my vote? 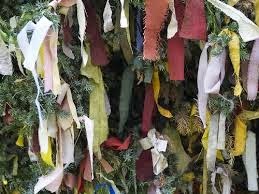 What qualities do these people have and how can I learn from them to become more inspiring myself. Sometimes the smallest of gestures can brighten a whole day. The impact those simple words had were far greater than the effort it took to say them. If we took the time to say the little things more often how would that shape the rest of someones day? What would be the impact of taking the time to recognise someone as your hero and celebrating that? I have been given an opportunity to take the skills I use at work and offer these for free to members of the public. Take a look online at the 'our peoples coach' website and learn about what coaching is and what it can do for you. If you are shopping in Derby this Saturday keep an eye out for us and bag yourself a free 10 minute coaching session from a qualified coach. Give yourself a gift of time, 10 minutes, to think about what you can achieve. Monday comes around so quickly, too quickly for me so I would like to rewind back to the weekend and share with you a project I have made to support my selling ventures. I have started to make earrings, mostly due to the magpie in me that loves all things shiny. My goal is to sell my earrings at local craft fairs, to fund my habit further. Displaying the finished product gave me an opportunity to draw on my love for paper and ink. I have had a little wooden house for a while and not been sure what to do with it. I enjoy making pretty things but prefer not to have too much stuff around the house. Inspiration struck and I decided to use my house to showcase some of my earrings. This is what it looks like when covered with a coat of gesso, white acrylic paint, stamped with a flourish and lined with pretty papers. I had great fun making it and attached springs to the 'ceiling' using a glue gun to hang each earring. This makes it so easy to add different earrings and to dismantle between sales. 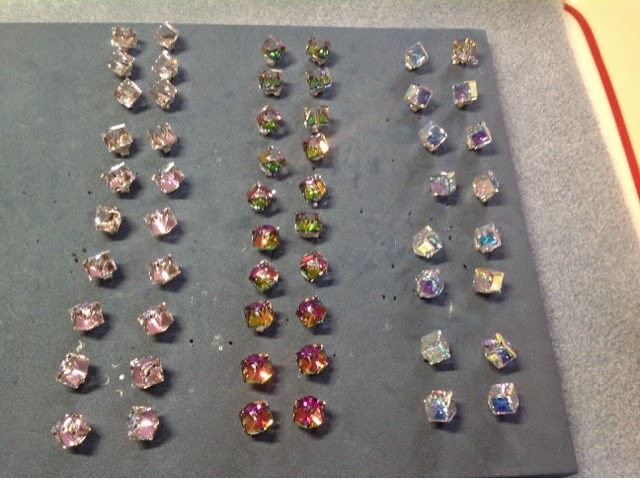 Choosing which earrings to put into each section will be tough, some of the smaller earrings may get lost in the patterns. Who doesn't love a simple Victoria sponge cake? Below is my favourite recipe taken from The River Cottage Collection. Add the caster sugar and continue to beat until light and creamy ( this will take around 5 mins using an electric whisk and 10 mins by hand) The lighter and fluffier the mixture is the easier it will be to blend in the eggs, which in turns helps to prevent the mixture from curdling. Add the eggs about a quarter at a time, adding 1tbsp of the weighed out flour with each addition and beating thoroughly before adding the next. Beat in the vanilla extract with the last of the egg. Sift in the rest of the flour, half at a time and use a metal spoon to carefully fold it in. The mixture should drop off the spoon easily when tapped against the side of the bowl. If it doesn't then add a spoonful of hot water. Divide the mixture equally between the prepared sandwich tins, spreading it out evenly with the back of a spoon. Bake in the centre of the oven for about 25 minutes or until the cake(s) are lightly golden and spring back into shape when gently pressed with a finger. Leave the cakes in the tins to cool for a couple of minutes before turning out onto a rack to cool completely. 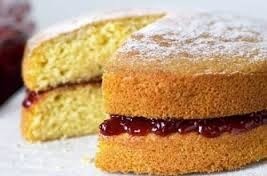 When cold spread on cake layer with the jam, place the second on top and dust lightly with caster sugar. This cake will keep for 5 days in an air tight container. I know this cake definitely doesn't last 5 days in my house! Put the kettle on and enjoy.